Globally, intrauterine devices are the second most popular form of contraception — but they are a much-overlooked option in the US. If you are looking for a long-term, reversible, and very reliable birth control option, an IUD could be right for you. Combined oral contraceptives, progestin-only contraceptives, NuvaRing, Depo Provera, condoms, and natural family planning. That long list describes only a portion of contraceptive options that are available to women who would like to avoid pregnancy today. This amount of choice is great, because it means that there is a contraceptive to meet the needs of almost every woman. Are you looking for a reliable contraceptive that you can forget about once it is placed, and that will protect you from an unwanted pregnancy for many years? Then this often-overlooked options might just be right for you. 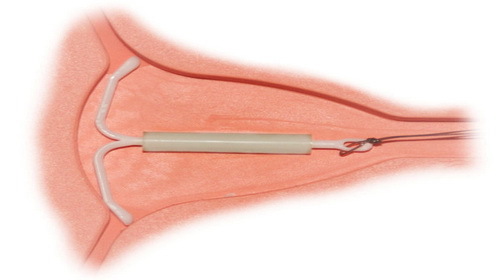 Many different types of intrauterince devices are on the market throughout the world, but all are small devices that are inserted into the uterus. Intrauterine devices are usually T-shaped these days, with a small string that hangs through the cervix. "Coil" is an alternative name for IUDs, after the shape of an early version of this contraceptive. IUDs come in copper-bearing and hormonal varieties and are inserted at a gynecologist's office, sometimes with the help of local anesthesia. How does an IUD prevent pregnancy? The presence of a foreign object within the uterus causes an inflammation. The copper or hormone reservoir also act to prevent pregnancy — more about that later. Intrauterine devices fall into a category known as long-lasting reversible contraceptive methods. Globally speaking, they are the second-most popular form of birth control. In the United States, they are not nearly as popular though an increasing number of women chooses an IUD. A few years back, only five percent of women who used contraceptives chose an intrauterine device. Now, that has risen to eight percent. The use of UIDs is on the rise for a good reason — no matter what type of intrauterine device you choose, it will be at least 99 percent effective and thus just as reliable as a getting your tubes tied (tubal ligation)! Though your IUD will last you five (hormonal IUD) to 12 (copper-bearing IUD) years, you can have it removed at any time. A quick return to fertility is one of the main benefits of an intrauterine device. Some women question the safety of intrauterine devices, because a 1970s IUD brand called the Dalkon Shield was associated with an increased infection risk. That type has been off the market for decades now, and IUDs are a safe contraceptive option for most women, including those who have not had children. One another thing we should address is the perception that intrauterine devices allow eggs to be fertilized, and merely stop them from implanting. Research shows that both copper-bearing and hormonal IUDs primarily work by preventing sperm from meeting egg — either by killing sperm cells, or blocking the entrance through thickened cervical mucus. Both types of IUDs also interfere with ovulation. Not everyone is a suitable candidate for an IUD, however. Women who think they could possibly be pregnant should never have an IUD inserted, as this is very dangerous for a fetus. Those with unexplained vaginal bleeding and certain medical conditions should not use an IUD either. The IUD does not protect against sexually transmitted diseases and is therefore not a good option for women who need this protection. If you are in a committed relationship and would like to prevent pregnancy for years at a time just by having a small device fitted, an IUD may be the perfect solution for you. We'll discuss the benefits and disadvantages of hormonal and copper-bearing IUDs in the next section. What are some additional preventative measures against pregnancy? What are some addititonal forms of pregnancy prevention?